at least i’m done with the concerts and singing for now, i have an upcoming gig this month, but thank God it’s still a few weeks away! oh i am so excited for it! 😀 😀 😀 share more details when the date is closer! 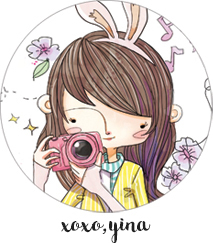 anyway, someone asked me to blog more about my personal life and my friends and my boyfriend and my family! sad to say, my personal life hasn’t been giving me much fodder to blog of late, other than attending events, i either have a very exciting time hanging out at YZ’s house, or i’m in a state of unglam photoshooting, or spending hours in rehearsals or just staring at my computer trying to get things done, or i don’t carry my camera around to snap any pictures. but i made abit of effort, and brought my camera out last weekend! met the girls for lunch before rehearsal/concert, on Sunday! 🙂 we found a new pre-concert hangout makan place: the newly open Loola’s by Awfully Chocolate at the Esplanade! i’ve been wanting to walk into this place for the longest time, because of the amazing display of cakes and desserts! teehee. it’s located on level two, you’ll see it once you step off the escalator! some very nice looking scones, breads and pastries that greet you once you step into the restaurant. i like the space too, it feels very spacious and airy! quite quiet and relaxed on a Sunday afternoon. a pot of English Breakfast to rejuvenate the soul. after much hemming and hawing over our selection of foods, we finally decided on the following! no regrets at all, all the dishes that we had were really nothing short of mouthwatering! very well seasoned and braised beef: it was still tender and soft! i loved the garnishing of sea salt that added a punch of flavour and crunchiness to the beef 😀 the sauce complemented the beef perfectly and we wiped up every single bit of sauce on the plate! couldnt resist ordering this the moment we saw the words “truffle oil infused”, and this dish did not disappoint at all! i hardly rave about scrambled eggs but the eggs were soooo well-done! (not literally, of course hehe) they were runny and soft and the consistency was just perfect! and of course the tantalising aroma of truffle oil in the scrambled eggs was just divineeee. the grilled cherry tomatoes burst in the mouth, exploding with sweetness and juiciness, and the mushrooms were delectable! the definite winner in my opinion: i took one bite and just had to exclaim IT’S DAMN GOOOOOD!!!! the pork belly practically melts in the mouth, and it tasted exquisite! the mustard seed sauce (i think!) at the side had chunks of green apple in it, and it tasted really really heavenly with the pork. what a pity the portion was quite tiny, i would have gladly eaten more of it!! anyways, we couldn’t get enough of the mushrooms, and ordered another portion on the side! along with two sunny side-ups… (Woon’s idea haha) the sunny side-ups are REALLY the best ones i have ever had! not too oily, and the eggs were cooked so perfectly to the point of semi-solid watery-ness but not liquid while the yolks were perfectly round and jiggly and burst into thick runny yolk once you attacked it with the fork…. it’s amazing! for a balanced and well-rounded diet.. of course we had to order some of those cakes and desserts i was talking about 😀 i love the desserts available at Awfully Chocolate and Everything With Fries (which is also opened by Awfully Chocolate!) so i wasn’t gonna pass up the chance for desserts! there they were, sitting so prettily and calling out to me. EAT ME! EAT ME! we ordered two to share, in the end! but as it turned out, it was still too much D: we weren’t able to finish everything because we were just too full! i’ve never seen soooo much frosting on a carrot cake before, i swear the frosting was like more than 1cm thick! tasted really good, with a slightly crumbly texture, the smooth vanilla ice cream set off the cake really well! kind of tasted like Nutella Tart from Everything With Fries, but with an additional hazelnut crumble on top! it came with dark chocolate ice cream that i recognised as being from Awfully Chocolate, but on the whole i thought everything was too chocolatey and i would have preferred vanilla ice cream with this! i usually love the dark chocolate ice cream from Awfully Chocolate but i guess this was too much chocolate in one sitting for me D: chocolate lovers would adore this though. bellies absolutely filled to the brim after the rich and scrumptious meal, but it set us back a pretty penny as well! one pax cost almost $50 for the amount of food that we had! it is kind of pricey, but i felt it was worth it for the quality of the food. i would like to go back to try the other dishes on the menu! might not be for big eaters though, as even the main dishes come in modest portions. Esplanade has got one of my favourite backstages. the walls are lined with photos and posters of musicians and artistes and singers, and it feels almost like a homage ground to the arts. our last major concert of the year: Due North. love the beautifull illustrated and designed programme booklets and posters! decent food, not too costly too! i was surprised because i’ve always thought it was a fairly expensively bar/restaurant. random picture of some mobile hangers that were on display in the Esplanade. made from toilet paper rolls and other recycled materials! they looked so colorful and resplendent i just had to snap a shot of them. lastly, i am extremely proud of myself today! had my first personal training session at Amore Fitness Bugis, and i survived my way through a 5KM run, 30 minute PT (personal training) session, and 1 hour low impact aerobics class! 😀 😀 😀 i’m so glad i didn’t die halfway through. next session is on Thursday and i am kind of looking forward to it! my personal trainer Nani is really really nice, and makes the torture slightly easier to bear! plus of course, i have got my workout buddy, Ling, and the two of us can cheer each other on, and also die together. TEEHEE. my first run in…. 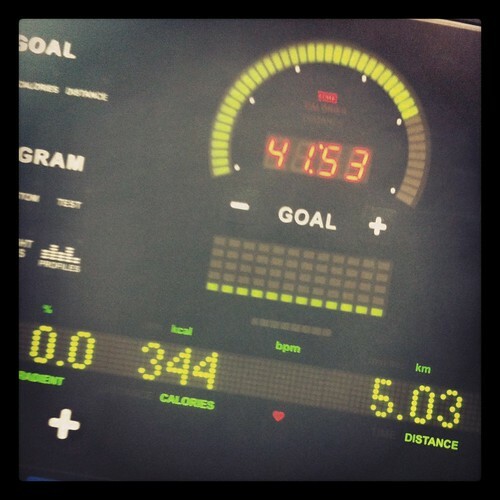 2 months :S but still managed to hit my 5KM yay! healthy lunch right after a good workout. 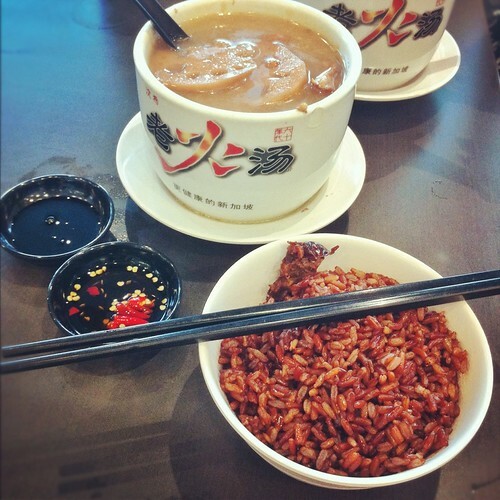 lotus root pork rib soup with brown rice! woooots. gonna go crash now cos it’s 2AM already! long day ahead tomorrow, and this week is gonna be busy too, with my new personal training and gym schedule, as well as work and events! nighty night!! !